Libraries have stopped being merely archives to become places where knowledge takes meaning. A Learning Commons is an allocated practice, at libraries, to spark collaborative learning. To qualify as it, it needs to meet a set of requirements. 1. Facilitate equal relationship that generates collaboration. 2. Guarantee that education can happen outside of the classroom. 3. Enable students to manage self-directed learning. The creation of innovative educational spaces goes hand in hand with the objectives presented by the Tec 21 Educational Model since they set the conditions for collaborative learning, problem-based learning, project-oriented learning, and self-directed learning. 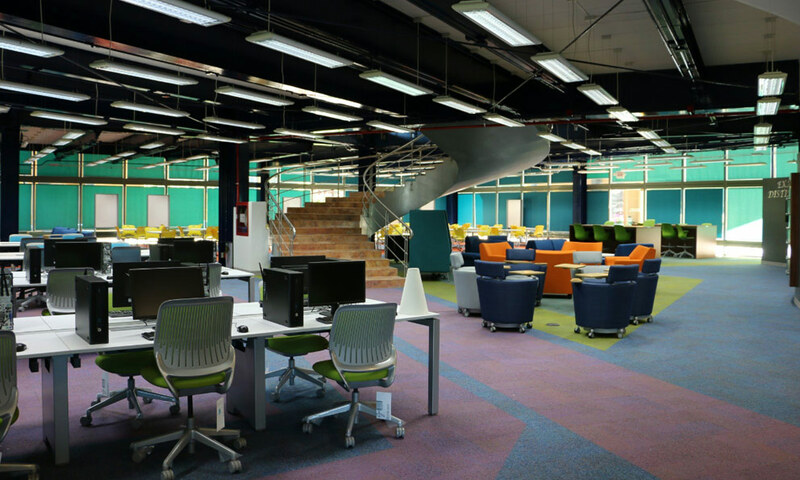 That is why Tec de Monterrey has created Common Learning spaces within its campuses. It is important to emphasize that a Learning Commons space does not replace school libraries as a whole. It consists of a program of activities for everyone to participate, from teachers and students to experts, librarians and anybody related to the operation of the educational process or libraries. How and why did they come to be? Learning Commons started to appear in school libraries at the beginning of the ’90s. Back then, they were described as a library service model that offered a continuous flow in the process of obtaining information and creating new knowledge. This first model relied only on the physical sources you could find in libraries. But the coming of the Internet brought fundamental changes in the way we understood bibliography and how to use it. The increasing availability of information sources and databases that could be accessed digitally from anywhere forced Learning Commons to transition; from being an information management methodology to be a collaborative learning methodology; turning libraries into new educational spaces. Physical sources play an essential role in support of learning, but technology advancements have opened other paths to obtain academic content. Students and teachers don’t go to libraries for the sole purpose of getting information anymore. Instead, they became a place that allows the co-construction of understanding of data provided by diverse sources. This is how we can explain the transition of libraries from an archive to spaces for learning commons. This change ensures the future of libraries as places for the validation of knowledge. The debate about their continuity does not center on the struggle between physical and digital content anymore, but in the invitation to renovate the space with new educational practices. Especially in the digital era, in which students carry the contents of a whole library in their pocket, the role of libraries is more significant than ever. Libraries should no longer be places to centralize the obtaining of knowledge but should transform into spaces to create context and meaning around it.